agents (other than diesel fuels)pursuant to hydraulic fracturing operations related to oil, gas, or geothermal production activities.’’. For the full text of the law, see here at the Government Publishing Office website. Naturally, with all of the toxic chemicals being allowed by this exemption, one has to wonder what is so bad about diesel fuels to explicitly exclude them from this otherwise blank check? The reason is the toxicity of the volatile aromatic compounds benzene, toluene, ethylbenzene, and xylene (also known as BTEX), which are known to the State of Maryland and many other agencies to cause respiratory problems from acute exposure (usually in occupational settings), in the long term to have toxic effects on the kidney, liver, and blood, and benzene specifically has been classified by the EPA as a carcinogen. Not only do these health hazards raise concern about injection through groundwater supplies to shale layers deep beneath the earth, but also air transmission through flaring and fugitive emissions. Now, when we searched our database for diesel fuels, we used the EPA’s own draft designation for regulating diesel fuels, a list of 6 unique types of petroleum distillates that industry would have to seek a permit for to use in future fracking. Kerosene, (Chemical Abstract Service [CAS] # 8008-20-6) was the most used, a total of 278 times, although only four reports explain its purpose. Three reports in Alaska identified its purpose as a freeze inhibitor, one in Texas listed its purpose as a corrosion inhibitor, but all the rest listed no explanation for its use. We wondered why kerosene was identified by the EPA as a diesel fuel, so I found a paper identifying kerosene as a hydrocarbon chain with 8-15 carbon atoms, well within the 8-21 carbon atom chain that identifies diesel fuel in general. That particular paper was written to determine how petroleum distillate contamination in groundwater could be detected. Given that the authors found total BTEX values from kerosene contaminated water were even higher (2440 µg/l) than than that of diesel fuel (2140 µg/l) and fuel oil (1400 µg/l), I believe it fully deserves its place on our list as a petroleum distillate too dangerous to frack with. 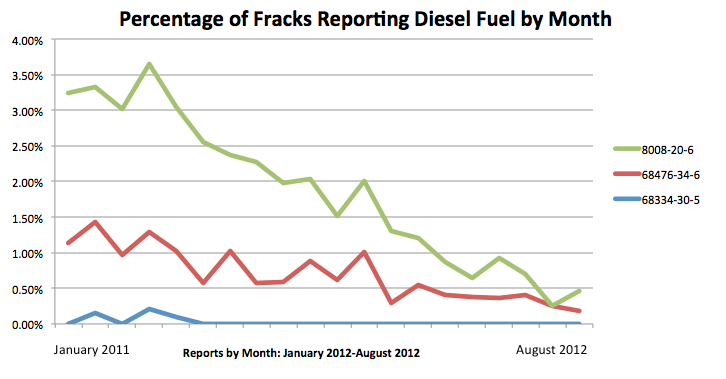 Back to our analysis, diesel fuel #2 (CAS # 68476-34-6) was in second place, used 166 times across 11 states. This time a wide range of uses were listed, mainly with some reference to acting as a gelling agent. The final diesel fuel we identified in our database was diesel fuel #1, which only appeared four times with no defined purpose. 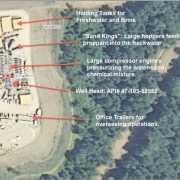 The representatives’ report did not state how many separate incidents they documented, only the volume, and while our database does not reliably calculate weight (due to limitations in the data source), we are certain that diesel fuels are still being used in fracking. However, despite wide-spread assumption that industry had stopped using it in 2005 (on account of no permits being issued), there is another actor who bears responsibility for this continued disregard of the law: the EPA. Note that earlier we said our analysis was conducted based on the fuels identified for regulation and permitting by the EPA’s draft guidelines on this issue. The act was signed into law by President George W. Bush on August 8, 2005, and the draft was only published to comment in May of 2012. Industry has not sought or received permits for using diesel fuel in fracking, in compliance with the Safe Drinking Water Act of 1974, because the EPA does not yet have the framework to process such requests. 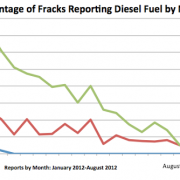 The frequency of diesel fuels’ use in fracking, according to voluntary industry reports, appears to be on the overall decline. However, this information is not complete, as reports are not timely (check back soon for more on this subject), and reporting on this same issue by Energy and Environment Reporter Mike Sorgahan found that companies can go back and modify reports. We intend to keep a close eye on this issue in the coming months as the record is filled out. Nevertheless, the ongoing disregard for the Safe Drinking Water Act is unacceptable, and must be addressed as soon as possible by both industry and our government regulators. The list of toxic chemicals exempted by the Halliburton Loophole is staggering, but to find that the one item still restricted is nonetheless being used without regulation or consequence is unacceptable. Furthermore, we believe that access to the data which we used to conduct this analysis is far too complicated and legally restricted to serve the purpose of full disclosure. We will be writing more in the near future about the challenges we have encountered to even reach the point were we can conduct analyses of industry activity and point out these glaring problems. Today’s post is by guest blogger Jim Sheehan, a GIS and remote-sensing specialist and PhD student at West Virginia University. Many of you are likely aware of the huge push to drill the Marcellus Shale for its abundant natural gas. You may have seen it for yourself, or been exposed to the many advertisements on TV, radio, and in print. Development of this new, unconventional source of energy, underlying a large expanse of the eastern US (Fig. 1), has exploded just in the past few years. Fig. 1. The red line shows the Marcellus Shale extent (drawn from USGS report) and the black line represents the wet-dry gas boundary (drawn from Penn State Marcellus Center for Outreach and Research map). Wetzel County is the filled green shape. Industry-sponsored ads* commonly tout that drilling the Marcellus will decrease our reliance on foreign energy, create jobs and stimulate the economy, and have a lighter environmental footprint than other types of energy development. However, behind much of the industry’s full-court press is the highly controversial hydraulic fracturing (“fracking”) process involved in Marcellus gas extraction, and other concerns such as the disturbances to local communities. Still, despite the issues, Marcellus drilling is unlikely to slow down anytime soon due to its value to the gas companies and those leasing their access rights at the very least. 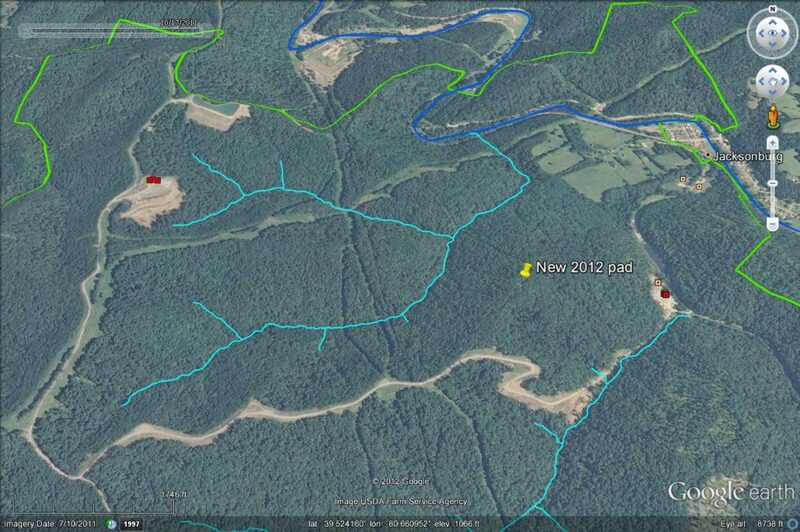 A new ridge top Marcellus drill pad in Wetzel Co. in a formerly forested lot. The drilling has ceased for the moment as the well apparently is being vented (photo: Jim Sheehan). 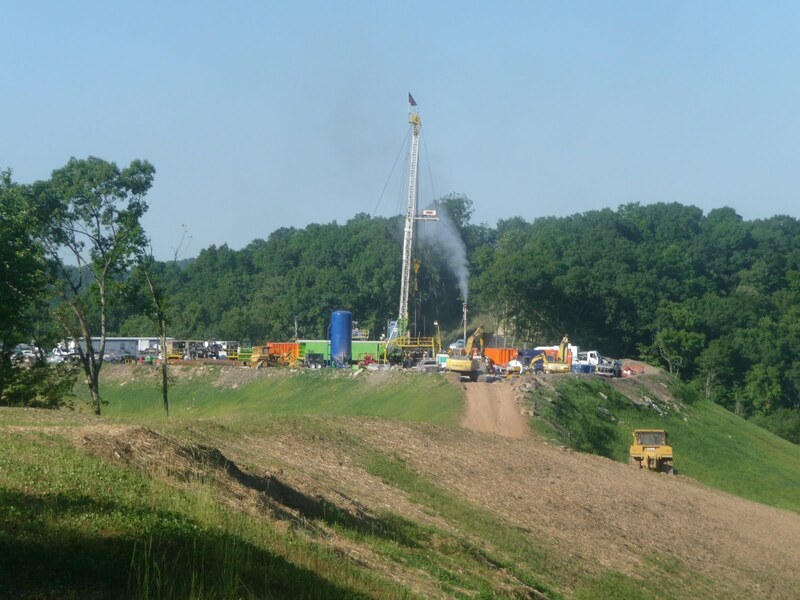 I often notice something about the pictures in the ads that conflicts with the nature of Marcellus drilling in some areas: the activity is often shown in a pastoral setting. Indeed, much of the industry does operate in rural areas dominated by agriculture. However, now that the price of natural gas has plummeted, the industry is increasingly focused on the more valuable “wet gas” region (approximately west of the black line in Fig. 1), which drops down into Wetzel County in northern West Virginia. Much of Wetzel Co. is forest, and as such exemplifies some of the best that “Wild and Wonderful” West Virginia has to offer. I believe this forest has particularly high value, ecologically and for other reasons, and may be vulnerable to this type of disturbance. With the help of SkyTruth, who kindly provided me some blog space and encouragement, here I explore the recent development of Marcellus (and other unconventional drilling) in Wetzel Co. To show the increase in drilling I used well information and geographic coordinates for 102 completed unconventional wells in Wetzel Co. from 2007-2011 that I obtained from the West Virginia Geological & Economic Survey’s “Pipeline-Plus” database. *Gas containing hydrocarbon compounds such as ethane, propane, and butane in addition to methane. Next, I zoom in to Wetzel Co. (Fig. 2) for greater on-the-ground detail. 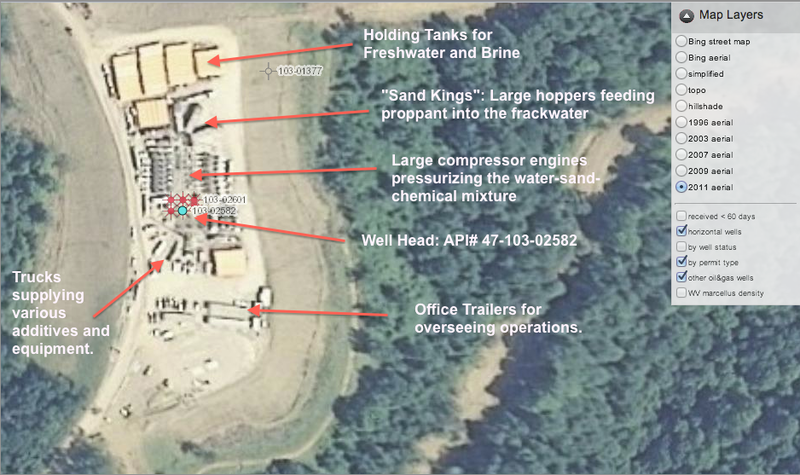 The 102 wells actually occur on about 50 separate pads, since multiple directional wells can be drilled per pad. A great feature of Google Earth is that you can view current and historical aerial and satellite images to explore change through time. Particularly valuable to me are the 2011 (current), 2009, and 2007 leaf-on aerial photographs from the National Agriculture Imagery Program (NAIP). Using the sequence of these images, I often see in great detail the land cover prior to preparation and drilling of the well site, characteristics of the well pad and the activity, and any associated infrastructure development (roads, pipelines, and holding ponds). Fig. 2. 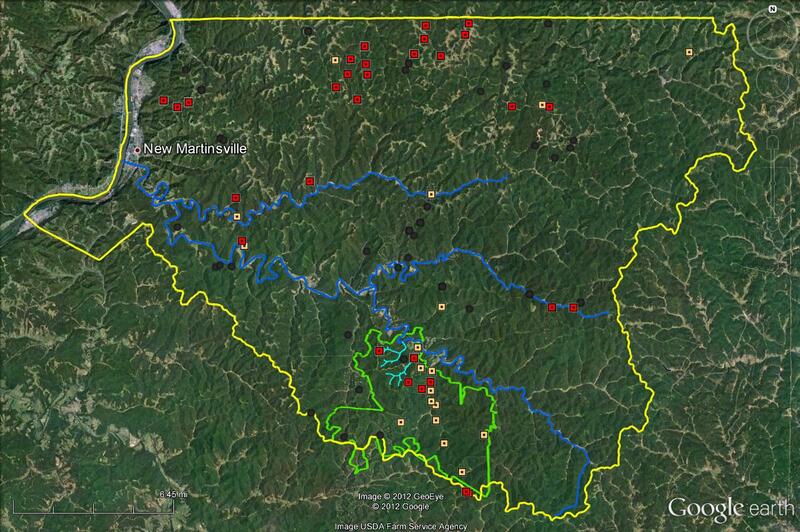 Wetzel Co. and 2007-11 well locations (red = Marcellus, pink = other Devonian Period formations), and proposed/in progress wells 2011-present (as of September, 2012; dark gray dots). Also shown are the Lewis Wetzel Wildlife Management Area (green outline) and two of its forested headwater streams (light blue), and the Fishing Creek streams (dark blue) that flow into the Ohio River near New Martinsville, WV. I’ve only begun to examine each well site and map the pad and any infrastructure, but here is an example of how large and problematic an impact can be. In Fig. 2, much activity is concentrated in the Lewis Wetzel Wildlife Management Area (green outline). While the state owns the surface, most of the subsurface rights are privately owned. Because the area is public, it’s easy to directly observe the activity (within reason! ), which I’ve done since 2008. Wyatt Run (Fig. 3 and the upper light blue stream in Fig. 2) is one of the area’s forested headwater streams that in particular interests me, since it was one of the most pristine but now has been degraded by new activity. The integrity of headwater streams is crucial to downstream water quality, so I’ve included in Fig. 3 Wyatt’s connection to Fishing Creek, which in turn flows to the Ohio River. Fig. 3. A side view of Wyatt Run at the Lewis Wetzel WMA, with a new Marcellus pad, holding pond, and access road as of 2011. The pad (and a new 2012 pad not captured by the photo) has “slipped” due to the steep topography characteristic of the region. The side of the ridge top well pad visible in Fig. 3, and a new one I’ve marked that occurred after the 2011 NAIP aerial, have “slipped” substantially due to the steep, rather unstable terrain, and are causing heavily sedimentation in Wyatt Run. There are efforts to correct the problem, but unfortunately it appears to be difficult to stop the erosion. As of September 2012 the sedimentation continues, and there have even been substantial direct impacts to the stream itself. Clearly, better planning is needed during the siting of well pads to avoid situations like this, and the amount of activity, at least in this watershed, appears to be at odds with industry claims of a light environmental footprint. I’ll also use this location to illustrate another concern. With new pads comes much associated infrastructure that can fragment previously continuous forest, and potentially have a negative effect on wildlife that prefer large, undisturbed forest patches. While some wildlife may benefit, new roads and pipelines can also act as corridors – bringing in undesirable or exotic plants and animals. The drilling and site preparation also result in noise and air pollution. I can say first-hand that recreation (hunting, wildlife viewing, etc.) is much reduced in the formerly popular Lewis Wetzel Wildlife Management Area, and heavy vehicle traffic and the dust and potholes it brings seriously disturb the local community. In closing, given the rapid increase in drilling between 2007-2011 and the amount of post-2011 proposed/in-progress wells I’ve begun to map (Fig. 2), it is clear that the impacts to the forests of Wetzel Co. can happen very quickly. 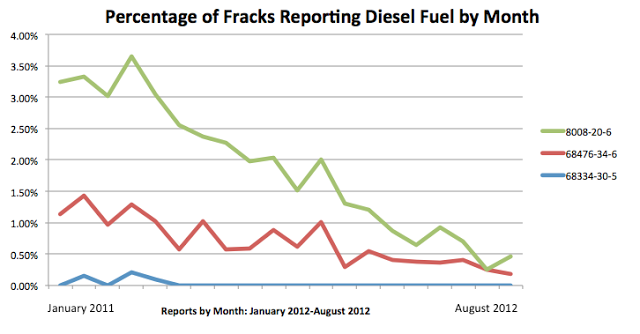 The next NAIP aerial should happen in 2013, and provide a new, detailed snapshot of drilling-related activity. In the meantime, I wish to use what we can now see to increase awareness of environmental costs seldom heard about, and make them an important consideration in the development of this energy resource.